According to the opinions of the most learned historians, Scotland’s national poet Robert Burns did apparently like the occasional alcoholic beverage and singsong. In total keeping with that, Dumfries’s Big Burns Supper is a rousing and, at times, raucous weekend-long affair which the poet will be no doubt be enjoying no matter where he is doing his carousing now. For fans of variety, the undoubted highlight of the weekend was Le Haggis. If the name is intended to suggest that this show aspires to be considered alongside the globetrotting and Olivier Award-winning La Soiree and its predecessor La Clique, then it has rather big cabaret boots to fill. Thankfully, these guys come with rather large cabaret feet. While La Soiree was born in London, Le Haggis is proudly a doonhammer of a show with plenty of local talent. Alongside an international array of variety stars, the ten-piece house band holds its own and is an attraction in its own right. Leading from the front, Dumfries resident Grant Dinwoodie is a kilted rocket of a frontman, a flashy flasher with a powerful blue-rock voice who injects raw adrenalin into proceedings from beginning to end. When not on the fiddle as part of the band, Marianne Fraser (above, right) provides a soulful counterpart to Dinwoodie, for example with her gorgeous rendition of Nick Cave’s The Ship Song. That number is a popular choice for more established chanteuses like Le Gateau Chocolat and Camille O’Sullivan, but Fraser makes it her own; there’s a heart-breaking poignancy which comes across as very personal and, if she isn’t singing that song with a particular someone in mind, I’ll eat your hat. The speciality acts are, generally, rather special. Aerialists Chloe Bass (above) and Jonny Grundy know how to strike a pose on the silks, straps and hoop, creating shapes which are both elegant and sensual. In terms, though, of knowing how to get an audience wet and excited, few can beat another aerialist, Bath Boy David O’Mer. He has, like fellow La Soiree alumni Ursula Martinez, franchised out his act and here it is the petit but perfectly formed Charlie Placais (top of page) who splishes and splashes his way into the audience’s hearts (and, possibly, other parts). Rounding off the bill, Missa Blue is a rare misfire: she shows off to mediocre effect quite a few art forms – burlesque, fan-dancing, fire-breathing, sword-swallowing – while not giving us much worth seeing in any one of those. 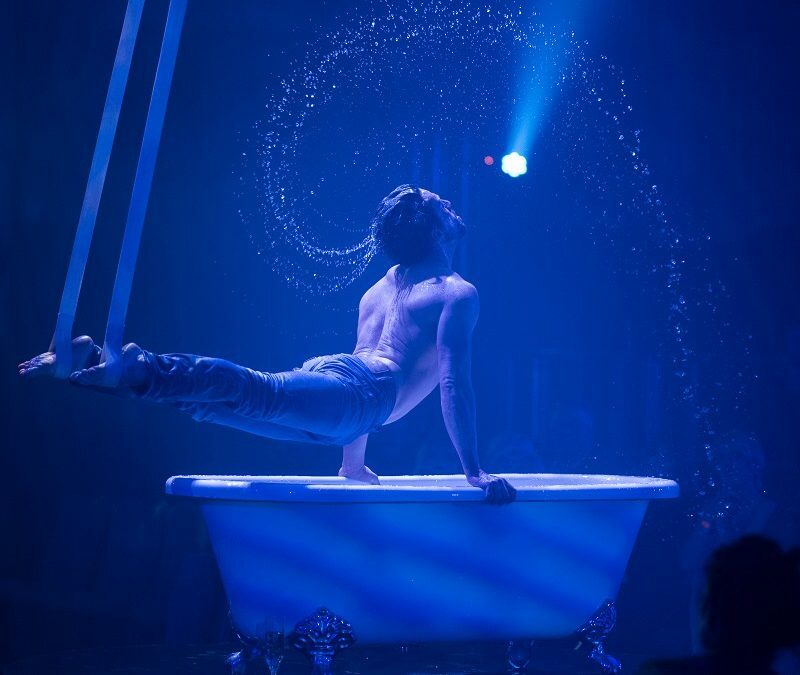 Le Haggis is little short of a national treasure and more than deserves to be spoken of in the same breath as La Soiree if only for its dedication to skilfully blending quality international variety acts with an exhilarating core troupe of performers. More information on the Big Burns Supper.